Yes, I’m Engaged! Now What? It finally happened, he asked and you said yes. You have been waiting for this for a while and cannot believe it has happened. You are now going to have your dream wedding, the problem is that you don’t know what that is. You were not one of those girls who started planning your wedding at age 7. You always wanted a wedding but you don’t know where to start. I have been there (surprisingly, I was just like you once) and I am here to help. Here are my five starting points to planning your wedding. 1. Sit down with your families, and decide the basics – Here are the questions you need answered: who is doing what, what is the budget, and when are you getting married? It is important at the start to let your family know how much help you want. They can help a lot or a little you decide, but make sure to let them know. You also need to know how much you are working with. Everyone has a budget, everyone. Figure out what yours is before you start following in love with people and places. Finally, figure out a date. You may not come up with the exact date but figured out dates that will work for everyone. 2. Find your locations – Many times your date is set by what date your venues are open. You will find the perfect place and know you are getting married there. If it is not open on your target date, you can change the date now before anything else is decided. Since you may change your date for your locations, you do not want to book your professionals first. 3. Figure out when you need to get your dress – Now that you know your date, you need to figure out your dress shopping schedule. A wedding dress takes 4-6 months to order, plus you will most likely need time to get it altered. I tell my brides if at all possible try to order your dress seven months before your wedding. Better safe then worried. I never what a bride worried her dress will not make it in time. If you are already passed seven months, then you need to go shopping very soon. These sites have tons of ideas in any theme and color scheme out there. They will allow you to see many different types of weddings quickly so you can start to learn what your wedding will look/feel like. 5. If you feel overwhelmed, look into a wedding planner – A wedding planner is no longer a luxury for the wealth. 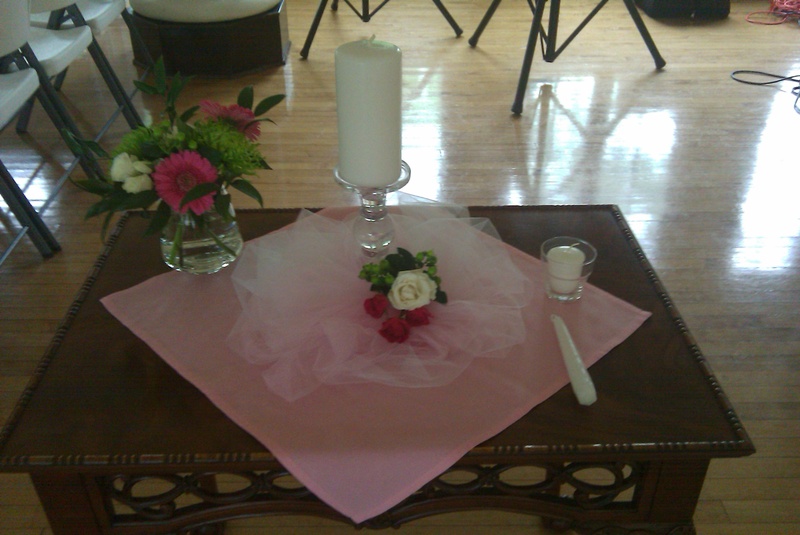 You might be surprised to know that a wedding planner is more accessible than before and could be your greatest asset. A planner can help you as much or as little as you want. We help you relax and enjoy planning your wedding. Planning a wedding can be a full-time job, and not something you have done before. Why not have someone there to be on your side and there helping you every step of the way. You deserve to have fun planning your wedding! This should help get you started on your wedding journey. Good luck! Did this help you? Would you add another tip, if so, what? Planning a wedding can be great fun, but sometimes it takes over. All you think and talk about is your wedding. I understand, and you can tell me all the details all day long, however, not everyone is like me. Maybe your hubby-to-be is feeling left out or your parents feel that is all you talk about together. Take this Thanksgiving weekend and just be with the ones you love. Leave the planning binder at home or in the drawer and just be. Be thankful for everyone in your life and have some fun. When the weekend is over, you will free recharged and ready to start planning again. Most importantly you will have spent time with the ones you love. What happens when your flowers do not arrive? I was watching a rerun of Four Weddings today (I love this show, four weddings in one episode, YES!) and it reminded me of why a wedding planner is so useful. The fourth bride was getting ready to walk down the aisle and no one could find her bouquets. It turns out that they were not there and the bride was on the phone, outside the church, yelling at the florist. Her wedding was delayed one hour to wait for the flowers. She and her guests were frustrated and annoyed. This is a great example of why a wedding planner is priceless. A good planner would have a schedule and know when the flowers are to arrive. If they are not there, we are on the phone calling and not you. In fact, you should never know that there is a hitch. We should be able to take care of it and have the situation under control before you need them. Planners are there for the unexpected so you do not have to be. I have talked before about the difference between hiring a professional versus a family friend to help at your wedding. I came across this article about Uncle Bob vs. A Professional Wedding Photographer and thought it was amusing. It shows in a humorous way why a professional photographer is worth their weight in gold. Again, you can still hire uncle Bob, you just need to know that you are not going to have the same level of photography as a professional. One of the few things that last after your wedding is the photos, so take the time and find a professional that you love and they will capture your day forever. I have just came back from vacation in Florida and I have been inspired. Have you thought of going to an exotic location for your wedding? You can choose a destination wedding for several different reasons. Be different – Maybe you want to get away and have a wedding that others you know are not. If you live in the midwest, not many of your friends are going to have a beach wedding. You could plan your wedding in Florida and have that beach wedding all your friends dream of. Different Location Options – Every city does not hold the same features. For instance, Indianapolis does not have an aquarium. Maybe you love fish and everything in the water. Think about going to a city where you could hold your wedding in an aquarium. When I was in Florida I visited Mote Aquarium in Sarasota and all I kept thinking was, what a great wedding site. By choosing a destination city, you can get a location that may not be available in your current city. Shorter Guest List – Not everyone wants a big wedding. If you fear that your guest list may get out of hand, think about a destination wedding. Since everyone on the guest list has to travel, you can cut it down to just very close family and friends. This way you can have a great wedding without feeling guilty about not inviting everyone you know. Costs Less – This is a feature that everyone uses with destination weddings. I want you to take this with a grain of salt. Depending on your circumstances, yes a destination wedding can save you money. You have less people coming so your per person costs are down and your travel costs are no different from your honeymoon costs. But depending on where you are going, you may still need a large budget. For example, if you only bring 20 guests you think that you have saved money by not inviting 100. If at home your per person cost is $25 and your destination per person cost is $150, you have actually spent more money. Just make sure that you do the math both ways to make sure you really are saving money. Finally, you are probably going to need more help with a destination wedding. Hiring a wedding planner can be very important. You can choose to hire someone at the destination location or choose someone in your own area. The person at the destination will know vendors, but will not be around to help you up to your wedding day. By choosing someone in your own area, they are there when you need them. Just because the planner is not in the destination city, does not mean that they cannot help with vendors. In my case, I am a member of the Association of Bridal Consultants, which is nationwide. If I need to find a local vendor in another city, I can tap into my association contacts and get the information I need. Having a destination wedding can be a fun adventure that both you and your family will enjoy. This past weekend I helped with a wedding and it made me think, do you have a weather back up plan for your wedding? If you are having an outdoor ceremony or reception you need to have a weather back up plan. Another wedding I just assisted with back in May was a perfect example. The ceremony was outside and the reception was inside. Leading up to the wedding and even that morning the weather forecast was sunny and in the 70s, perfect right? Guess what, at noon it was raining. We had to think fast and rework the reception room, as it was the back up rain plan. Unfortunately, we cannot control the weather (trust me if I could, I would). You need to have a plan ready for what to do if rain does happen. You also need to know at what time a final decision needs to be made. Some brides think that they can wait until 30 minutes before their wedding to make the call, but that is not feasible. You need to have time to make the back up ceremony/reception site the way you want it. Another weather problem you may not have thought about is heat. This past weekend at the wedding, we were concerned that the rain predicted was going to ruin the outside cocktail hour. The reception site did not really have another room for us to use for the cocktail hour and we were counting on using outside area. The original plan was to use the parlor and the patio for the cocktail hour. All week rain was predicted and we were worried. Then Saturday came and the rain never came, great right? Wrong, it was almost 90 degrees with Indiana humidity and no one wanted to go outside. We ended up with 250 people in a small parlor and small gathering space just before the patio. It ended up working out, but it could have been a disaster. Heat is something we do not often think about at a weather problem for a wedding. If you are having an outdoor ceremony and it is going to be hot and humid, you may have a problem. Remember that you will be wearing a layered wedding dress and your groom and groomsmen with most likely be in black tuxes. If you are having a summer wedding outside, you may want to think about having a back up heat plan along with your back up rain plan. The important message here is be prepared for anything. Again, we cannot control the weather but we can help control the situation. If you are worried that you will not be prepared, you may want to talk to a wedding planner to see if maybe you need a little help for your wedding day. We are able to think fast on our feet and can help you when ever mother nature decides to change her mind. This was a beautiful gesture that allowed the loved one to be still be part of the ceremony. I wanted to share this with you to show that there are many ways to honor loved ones that have passed before your wedding day. Maybe you have a parent that is no longer with you, it would be a wonderful gesture to light a candle on your way to the altar to honor their memory. I wish that this candle was never needed, but if it is, this allows all family members to be a part of your special day.